Oh, Kate Spade. How is it possible for you to create so many adorable and fabulous pieces time after time? Well, you do ... and the Glitterball Gia is no exception. 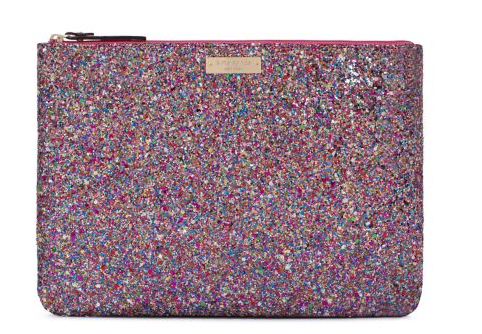 Isn't this glittery pouch just the most fun piece to take to a New Year's Eve party? And today, one lucky person has the chance to win the Kate Spade Glitterball Gia! This giveaway has a retail value of $98. Here's how to enter. 2) Like The Beauty of Life on Facebook and leave a comment on the Facebook post about this giveaway telling me why you want to win this Kate Spade pouch. 4) Follow me on Instagram and like my photo of the Kate Spade Glitterball Gia. This giveaway ends on Saturday, December 22 at midnight. One winner will be chosen AT RANDOM on Sunday, December 23. Maximum of FOUR ENTRIES (one for each way listed above). Multiple entries will be disqualified. Giveaway is open to US residents only. Love love love! I love the multicolored sparkles especially this time of year! This bag is so awesome! It would look great on me! Oh my goodness, this clutch is perfect and in my favorite color! Love it! this is so cute and i promise to treat it well ;) thank you so much! This clutch is so perfect! I am girly and glittery just like it so it would be a much used accessory! Tweeting and following you as @kelliechio Thank you! This bag is fantastic. I love it! I am a huge Kate Spade fan! Love this little beauty! I would love to win this, it's so pretty! Kate Spade designs beautifully. I'd love to win this give-away! Love this clutch!! Thanks for the chance to win!! i love kate spade, and i love the mutlicolor pouch..it's so fun a festive great to carry around in your bag! I'd love to win! This is so great for jazzing up a LBD! Oh, how I love the sparkles on this! Thank you for the chance to win.